Welcome to January 2017 issue of GL's Newsletter providing information and insight into our enhanced 10 Gbps Network Testing Solutions, which is enhanced with Multistream Traffic Generation and Analysis and RFC 6349 based TCP Throughput Testing features. 10 Gbps Ethernet offers data speeds up to 10 billion bits per second, generally over single mode or multimode fibre optic lines. It is also referred to as 10 GE, 10 GigE, or 10 GbE. 10 Gbps is compatible with existing Ethernet protocols and can be easily integrated into existing networks. GL's PacketExpert™ 10G with two 10 Gbps Optical Ports and two 10/100/1000 Mbps Electrical/Optical Ports provides comprehensive testing of 10 Gbps/1 Gbps Ethernet/IP networks. With the capability to generate/receive traffic with stacked VLAN (Q-in-Q) and stacked MPLS, PacketExpert™ finds use in testing a wide range of networks - from testing individual links/switches, testing local Ethernet/IP networks (LAN), end to end testing of Wide Area Networks (WAN), testing Core/MPLS networks, and much more. The two important features added to the 10 Gbps Network Performance Testing are: Multistream Traffic Generation and Analysis and RFC 6349 based TCP Throughput Testing referred to as ExpertTCP™. GL's Multi Stream Traffic Generator and Analyzer is capable of generating and analysing up to 16 IP/UDP streams at full wirespeed of 10 Gbps. It is particularly useful for end to end performance testing of IP networks. Traffic Generation supports simulating up to 16 IP/UDP streams. User can configure different MAC/IP addresses and UDP ports for each stream. Also, each stream can be configured with different frame lengths (both single as well as mix of frame sizes) and rates and this generation capability helps users to emulate various application traffic like VoIP streams, data streams etc. Multi Stream Traffic Generator and Analyzer simultaneously support analysis of up to 16 full wirespeed streams. Analysis provides detailed statistics such as Throughput, Packet Loss, Latency (Round trip latency) and Jitter and all these statistics are provided per stream. GL's ExpertTCP™ is intended to measure end to end TCP Throughput, and is based on RFC 6349 test methodology. This test method can be used in conjunction with RFC 2544 or ExpertSAM™, to measure the true TCP throughput experienced by customers (which can be different from the IP layer throughput measured by RFC 2544/ExpertSAM™). ExpertTCP™ supports up to 16 TCP connections, at full wirespeed of 10 Gbps. All 3 RFC 6349 stipulated tests - Path MTU, Baseline RTT and TCP Throughput tests are supported. Detailed results like the TCP Throughput, TCP Efficiency, Buffer Delay Percentage, TCP Transfer Time Ratio can be obtained. And various graphs/statistics of Throughput, Retranmissions and Round Trip Times help users gain insights into the various aspects of TCP performance. GL's PacketExpert™ 10G's Wirespeed BERT capability measures Bit Error Rate on Layer1, Framed Ethernet (Layer2), MPLS (Layer2.5), IP and UDP layers. It supports generating various PRBS patterns such as 29-1, 211-1, 215-1, 220-1, 223-1, 229-1, and 231-1 including constant patterns such as All Ones, All Zeroes, Alternate Ones-Zeroes and user-defined test patterns ranging from 1 bit to 32 bits. Selection of optional sequence number insertion allows detecting out-of-sequence packets and packet loss. PacketExpert™ 10G supports all RFC 2544 Tests for the performance benchmarking of individual network elements. These include Throughput, Latency, Frame Loss, and Back-to-Back tests. Similar to BERT, RFC 2544 can be done over Framed Ethernet (Layer2), Stacked VLAN (Q-in-Q), Stacked MPLS, IP and UDP. GL's ExpertSAM™ is intended for multiservice testing to measure the maximum performance of the device or the network under test. ExpertSAM™ is a set of procedures that test the ability of Ethernet-based services to carry a variety of traffic (voice, data, and video) at defined performance levels. PacketExpert™10G supports Smart Loopback and automatically swaps the MAC,IP and UDP address/port and loops back incoming frames at full wirespeed of 10 Gbps. Loopback is useful in many testing situations, where there is a need for a remote device looping back the test traffic. PacketExpert™ 10G supports capture of packets at wirespeed and also storing of the captured packets in popular file formats (pcap, ngpcap) for later analysis. 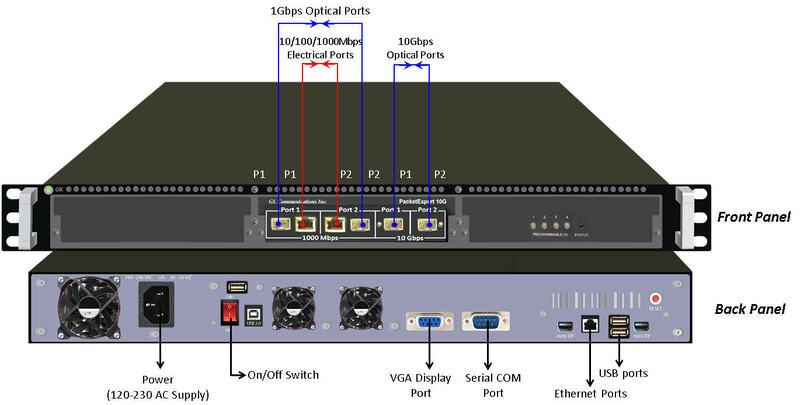 The two 10 Gbps ports can act as a high performance network tap, capturing packets at wirespeed from both directions, at the same time acting as a transparent link between two end nodes. PacketBroker™ also acts as a network tap and captures wirespeed traffic in both directions. It also supports wirespeed filtering to capture only traffic of interest. And also allows certain packet modifications to insert useful information such as timestamp into the packet before sending out. 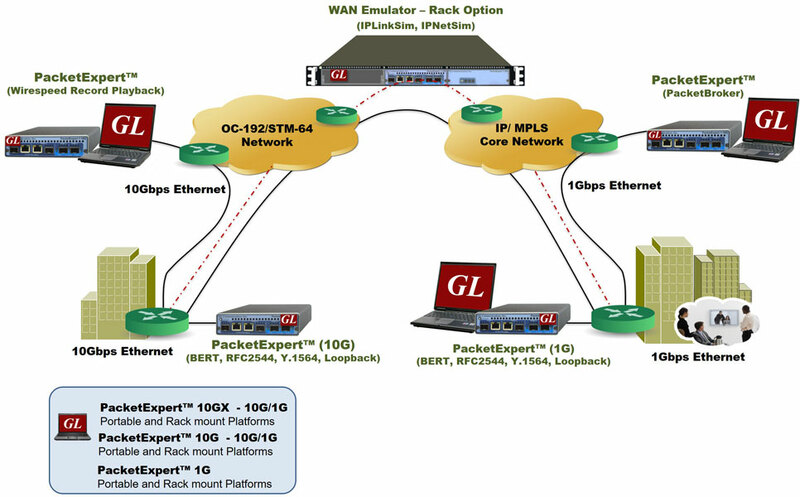 GL's IPLinkSim™ and IPNetSim™ products support WAN emulation. These products are capable of emulating a WAN link, and introducing typical WAN impairments like Bandwidth Throttling, Latency, Jitter, Packet Loss, Packet Reordering, Packet Duplication, Packet Corruption, Congestion emulation etc.